So if you’re a regular viewer of my fashion posts, you’ll probably have noticed the same name creeping up post after post in the photographer credit section. My fabulous friend and fellow blogger Rebeca Elen and I have been collaborating on lots of projects and shoots recently as I want to increase my confidence and better my content and she wants to expand her portfolio and do some creative experiments. 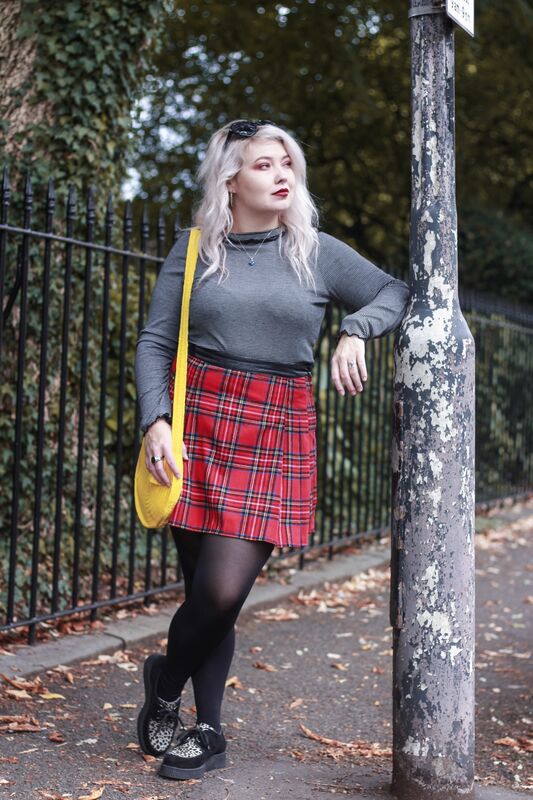 I decided that I wanted to do a post on some of my favourite tartan pieces and how I’d style them so we headed on up to Clifton one day to take some shots. We spent a few hours out and about shooting 3 different outfits and after whittling down the final shots and editing them, I realised there were too many I liked to put them all into one post. I realise that makes me sound a bit vain but hey, Becky’s a genius and I said I wanted to improve my confidence. So the first outfit in my trio series contains a tartan skirt. I bought this in Primark for a bargain £4 and also grabbed one in black and white check aswell. I’ve never really known much of a difference between tartan, check and plaid but what I do know is that I love all of them. I’ve always had a soft spot for authentic red tartan though, as much as I love all of the other colours, too. The skirt is not quite the original tartan print but I adore it because it’s high-waisted and pleated with a faux leather waist band. It zips up on the side making it super easy to get into aswell as really comfy to wear. It brings you in so nicely at the waist and the fabric it’s made out of is pretty thick so it tends to hide any lumps and bumps and give a really nice shape. I can’t say that it’s an item that I get a massive amount of wear out of but for how much I like it when I do wear it and the fact that it was only £4, it’s worth keeping. I decided to pair it with a dark blue and white striped long sleeve crop top from River Island. It’s quite a plain item but has some really cute frill detailing on the neck and is actually half price in their sale at the moment! The whole print clash trend in fashion is something that I absolute adore and I feel like the transitional seasons are the perfect time for them. I’m not sure how well a bolder choice of stripes would’ve matched with this skirt but I think these two go perfectly together. Again, talking print clash, animal print has been gradually creeping back in for the past year or so and has all of a sudden taken over this Autumn. These creepers from Underground London feature an animal print panel on the top which I think adds the cutest pop of interest to an outfit. Having two such loud prints in one outfit can often scare people off but I think when they’re in the right quantities they can be really quite intriguing. The little yellow straw bag is also from Marks & Spencer and although it quite literally fits nothing more than my phone and my debit card in, I still had to have it. I tried my hardest but just couldn’t seem to find a basket bag that was cute, in my budget and in stock so this was my alternative. Maybe next year I’ll find one, when typically they’re completely off trend. Not that 99% of the things I wear are on the runways, anyway! Are you daring enough to introduce a print clash in your outfits? "An Unbreakable Bond With bilou!" "The Tartan Trio: Schoolgirl Sweetheart!" You look AMAZING, Alice and I love that yellow bag!! I can’t say I’d be daring enough to try a look like this (I mostly dress in black these days) but you definitely pull it off. Omg I’m obsessed with this outfit! You look amazing! I really love this outfit – I’m definitely going to have to hunt down tha skirt in my local Primark. I love this outfit so much! You look absolutely amazing! Also that skirt is gorgeous! What a great outfit! It really suits you. That skirt is beautiful, I can’t believe it’s only £4! I absolutely love this outifit – I really wish I could pull of tartan. I actually like the clashing of prints. It’s not overwhelming, and the colours go so well together. I can really see your confidence growing in each fashion post you do. Can’t wait to see more! And for your question about plaids and tartan, If I remember correctly from fashion school, all tartans are plaids, but not all plaids are tartans?! It’s something to do with tartan repeating the lines both horizontally and vertically, when plaids don’t. It’s all confusing. Love your style Alice! Tartan and those creepers is the dreamiest of combinations! Been hunting around my local Primark trying to find that skirt because for £4, that’s an absolute steal!